I want some bright lights to flash in the studio when the VFR extension rings (rather than bells sound). The analogue telephone circuit uses a ringing signal of 80-90V AC at 25 Hz (it is quite strong; if you accidentally hold on to bare telephone wires it can definitely be felt!) – and all sorts of random signals can come down a phone line. 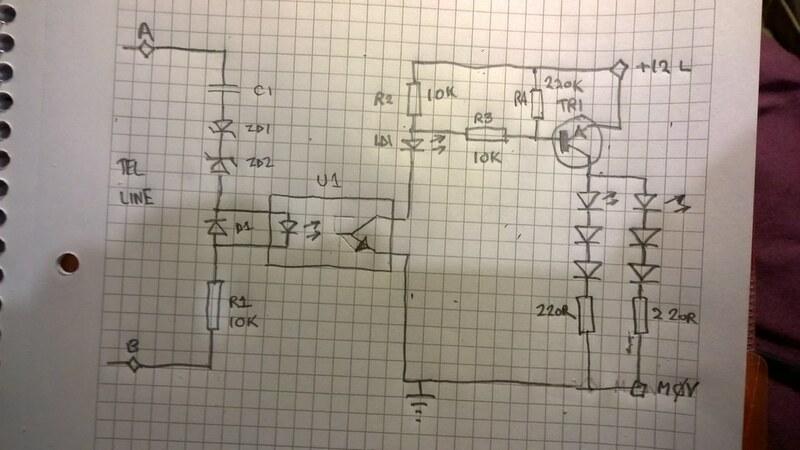 So I had to build a circuit to isolate the phone line from any other equipment; not let through any DC electricity (or the phone line will be permanently engaged) and reduce the voltage from the line to trigger an optoisolator. the circuit is here – the zeners are 10V and capacitor (to block DC and not seize the phone line) 470nF. The PNP transistor switch is used as the opto is connecting to ground – the 10K resistor which also acts as a check for the opto output (as those 6 LEDs will eventually be in another unit elsewhere) also is a pull-up resistor for the transistor switch. The LED LD1 still glows very dimly even when the circuit isn’t active; maybe I should remove the 220K resistor (that was recommended in the original transistor switch design) as there is actually only 18k resistance between the 12V supply and the “active” LED and possibly leakage current gets through.